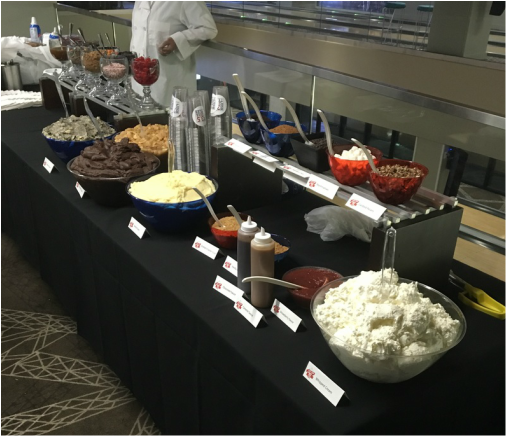 From 12 to over 500 people, we can cater your birthdays, graduations, company parties, sporting events, schools, class & family reunions, religious celebrations and any other celebration you are planning . Let everyone at your party have their own piece of pie with our Pie Flights! These mini Pick Your Pies are sure to satisfy your guests! Only $2.00/cup(Sold in packs of 12)! 1-24 cups: $2.00/cup. Choose 3 crust, filling and topping combinations. 50+ cups: $1.80/cup. Choose 5 crust, filling and topping combinations. *Whipped cream included with all flights. 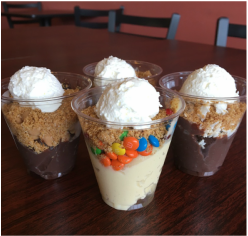 Bring Pick Your Pie to your location with our Pie Bar! Guests are able to create their own custom Pick Your Pie. Choose 3 crusts, 4 fillings and 6 toppings (whipped cream included), and let your guests build their own personal creation. ​ Right on Mayfield Road between Lander and Brainard. On the north side across from the House of Lights and Dunkin' Donuts.